Limi and I have a friend from East Africa. At every African party and get-together, she cooks for hours beforehand, and brings the most amazing food to the party! Some of the best African food I have had was made by her. 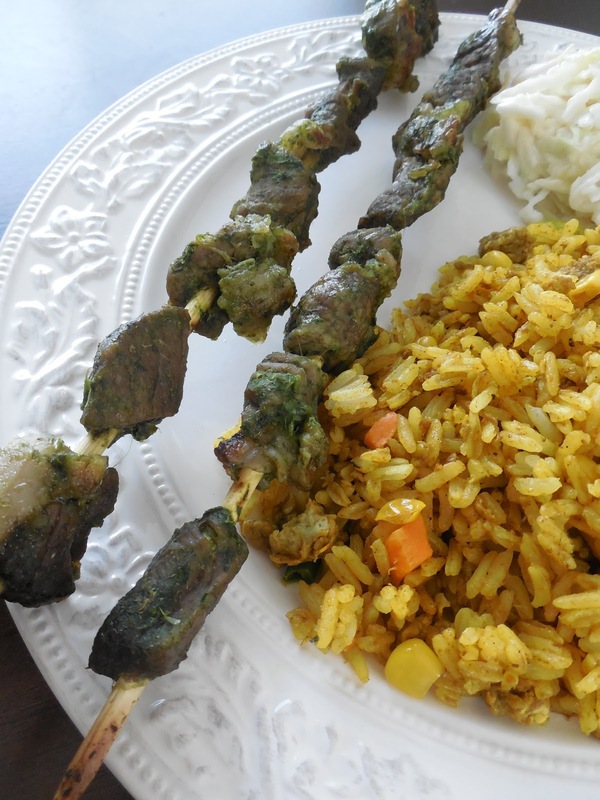 Among these are the Beef Verde kabobs that she makes. I actually don’t know the real name of these kabobs, so I had to come up with my own name. She gave me the recipe though, which I made months ago, when I was in school! I went into the archives to find this recipe (and picture), but I knew it needed to be posted, so I present you with my absolute favorite skewered meat of all time! I served these for my neighbors one time, who said that he had eaten almost the exact same thing on his mission in Central America. I guess there are like-minded chefs around the world! This marinade though, has amazing flavor. It is a bit spicy, but combined with the meat it is also sweet and juicy. Although I bake these in the oven (I don’t have a grill), these would be awesome if you grilled them! Blend green onions, cilantro, parsley, jalapeno peppers and bouillon cubes until well mixed. Cut the beef into 1-inch cubes. Pour the marinade over the meat and let it soak for couple of hours. Soak bamboo skewers in water 30 minutes before you are ready to cook the meat. Skewer the beef and bake on low broil until they’re tender.